White paper on crime 2004 Part2/Chapter6/Section2/1. Fig. 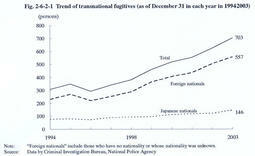 2-6-2-1 shows the trend of suspects who committed offenses in Japan and escaped abroad over the last10years.The number of transnational fugitives has increased since1997and reached703as of December31,2003,up by12.5%from the previous year. Table 2-6-2-2 shows the number of transnational fugitives by nationality etc.as of December31,2003.Most transnational fugitives,275(39.1%of the total),were Chinese,followed by Japanese with146(20.8%),Brazilian with56(8.0%),and South/North Korean with46(6.5%). 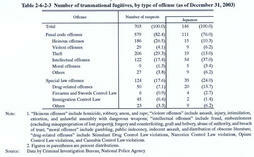 Table 2-6-2-3 shows the number of transnational fugitives as of December31,2003,by type of offense.Most of them,206suspects,committed theft,followed by heinous offenses,intellectual offenses,and drug-related offenses. 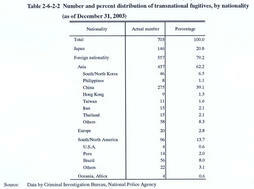 If examined countries and regions to which transnational fugitives seem to have escaped as of December31,2003,125suspects(including11Japanese)seem to have escaped to China with the largest share,followed by the Philippines with37(including26Japanese),South/North Korea with30(including7Japanese),and the United States with21(including18Japanese)(Source:Data by Criminal Investigation Bureau,National Police Agency).